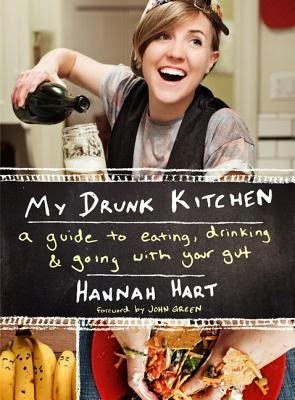 stasialikesbooks: Book review: My Drunk Kitchen: A Guide to Eating, Drinking, and Going with your Gut by Hannah Hart. Book review: My Drunk Kitchen: A Guide to Eating, Drinking, and Going with your Gut by Hannah Hart. One day, lonely cubicle dweller and otherwise bored New York City transplant Hannah Hart decided to make a fake cooking show for a friend back home in California. She opened her laptop, pulled out some bread and cheese, and then, as one does, started drinking. The video was called "Butter Yo Sh*t" and online sensation My Drunk Kitchen was born. My Drunk Kitchen (the book!) includes recipes, stories, colour photographs, and tips and tricks to inspire your own adventures in tipsy cooking. I feel like I should start this off by saying straight out that this is not really a cookbook. I understand why it's being marketed that way but I do worry that some people who aren't familiar with Hannah and her youtube series also titled My Drunk Kitchen might buy this book expecting some actual recipes they could replicate at home and come away a little disappointed. This is not to say that I don't think this is a good book (or that there aren't at least a couple of recipes in here that I see myself trying to recreate in the future. Saltine nachos, anyone?). I think this is a great book. Hannah Hart's typical humour is present in abundance and fans of her youtube videos will not be disappointed. My Drunk Kitchen is like a big sister giving you advice not just on cooking but more importantly on life in general. Hart is, as usual, incredibly funny, infectiously optimistic, and unfailingly honest, in the best way possible. The book does take the form of a cookbook, which I think is very clever, with each pun-tastically named recipe containing a life lesson or piece of advice, much like the standard format of the My Drunk Kitchen videos themselves. My Drunk Kitchen is full of advice from the Hart (I had to) and honestly, I'm gonna go ahead and suggest that it might just be impossible to read this book and not feel more positive about life afterwards. Fans of Hannah will definitely enjoy this book but if you've never seen her videos then it might leave you a little confused. Luckily, you can fix that right now. A very small second hand book haul. Hot Key Books twitter competition haul.